By staff writer Lisa A. White. Photos Copyright © Lisa A. White. 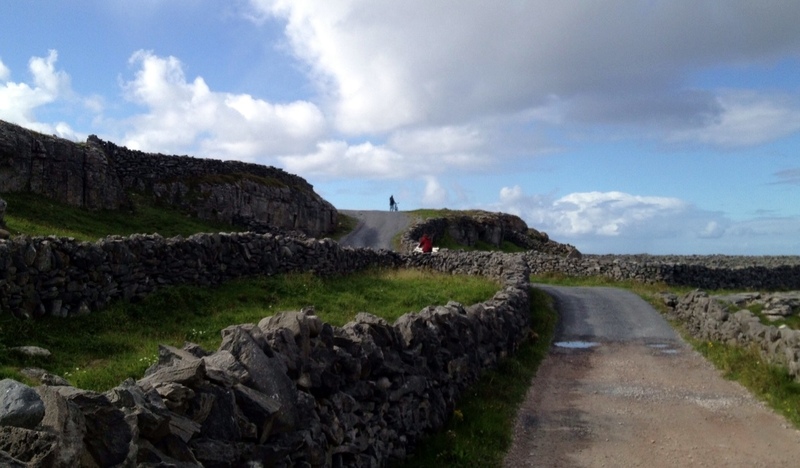 AFTER A FEW DAYS on the Dingle Peninsula, Dan and I braved the highways of Ireland and headed toward Doolin, which is rumored to be a hotbed of traditional Irish music. 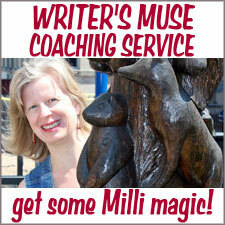 As we often do, we waited to make reservations for accommodations until the day before. “Yes, hello? We will be arriving tomorrow.” I love AirBnB (the website or the ipad app) specifically for this reason. While we were still in Dingle, we contacted Aisling through AirBnB and planned to stay in her B&B. 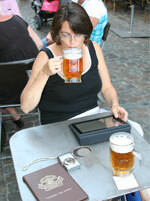 She also mentioned that she has a three-bedroom house “in town” if we preferred walking distance to the pubs. Just after we hung up, we met Sharon and Tim, another American couple staying at Browne’s B&B. They, too, were looking for a place to stay in Doolin. Being somewhat less than shy, I suggested sharing the house in Doolin. A plan was hatched that ultimately worked out beautifully for all (p.s. Aisling’s house was wonderful!). Dan and I chose the Conor Pass route from Dingle to Doolin. This route twists and turns up and over the highest mountain pass in Ireland. From the road and the overlooks, we had incredible views of the desolate but beautiful bare mountains, corrie lakes, and the sea in the distance. The road is narrow, steep, and often shared with crazy bicyclists. Eventually, we made our way to the tiny village of Doolin. We arrived a few hours before Sharon and Tim so we drove to the nearby Cliffs of Moher. Minutes after we paid the entry fee, the infamous rains of Ireland began to fall. As we walked, the Cliffs disappeared in a wall of fog and rain that engulfed us. Soaked, we ditched the idea of an afternoon jaunt along the Cliffs and opted to eat the local bread, cheese, and wine that Aisling provided—a much better idea! That first night, we all walked through a light drizzle to McGann’s Pub, and ordered Irish Beef Stew, Brown Bread and Guinness drafts. Musicians gathered about 9 p.m., including an American-Irish woman with her guitar and a life-goal of playing in an actual Irish pub. She did well. The other musicians encouraged her to join in, and for a bit, she sang solo. Her songs were traditional Irish ballads and her voice was quite different, a bird-like trill. She clearly added a check to her bucket list and was well received by locals as well as visitors. The sun returned the next morning so Tim, Sharon, Dan and I decided to make our way to Inis Oirr, the closest of the Aran Islands. The ferry ride over had incredible views of the Cliffs of Moher which had been obscured by dense fog the day before. We arrived on the island greeted by a host of horse-drawn carriages willing to carry us around the island for about 5€ per person. Being the wayward types (i.e. the ones seeking to get lost), we opted for bicycles, which were over double the price on the carriages. We had twice as much fun. 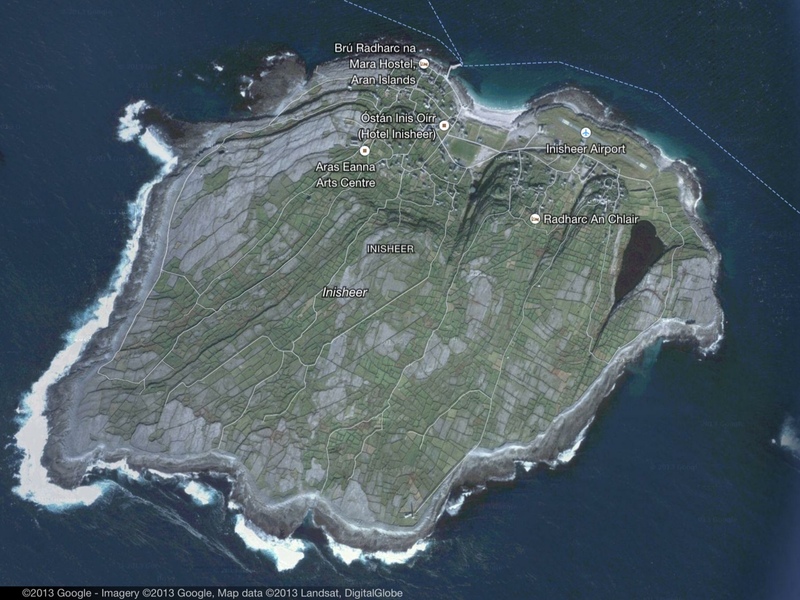 Inis Oirr is a tiny island, about 2 km x 3 km (or 1¼ miles by 1¾ miles). The satellite image of the island looks like a fan coral: the light lines are extremely narrow roads (or more appropriately called bike/cart paths) and the dark patchwork patterns are the miles and miles of ancient dry stone fences. We began riding the bikes along the northern coast of the island, then wove our way through the maze of stone walls. As we meandered, the wall variations began to make sense. The lace-like walls let breezes through, animals were grazing in the more solid areas. Every so often we noticed a low section with a couple of horizontal stones jutting out on each side as steps to easily climb the wall. Visit Stone Art blog to find out more about the walls and Inis Oirr’s annual Festival of Stone (Feile na gCloch). 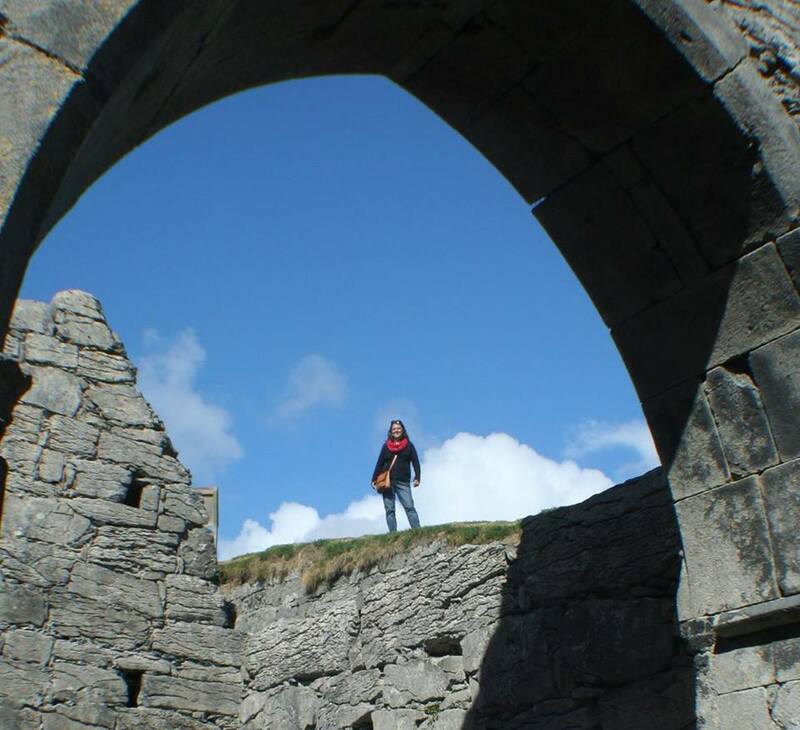 Other highlights of our exceptional day on Inis Oirr included exploring the ruins at Teampall Caomhán, a 10th-Century church which sits below ground level with sand and gravestones all around. Further on the southern coast are the rusty “bones” of the Plassey, a ship which was washed ashore in a 1960 storm. Our bicycle ride from one end of the island to the other was enjoyable, not terribly difficult, and a perfect way to explore. Given a second day on Inis Oirr, I would have added a carriage ride to learn more local history and color. 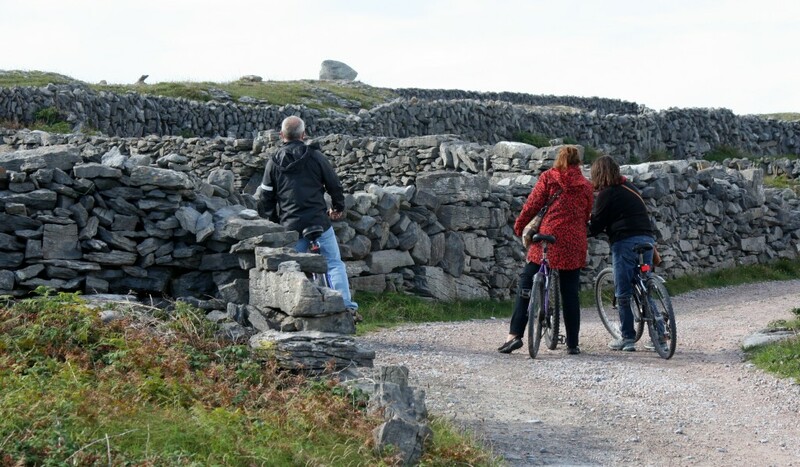 No matter which is your transportation choice—feet, wheels or hooves—Inis Oirr is well worth the effort! Back in Doolin after our Inis Oirr adventure, Gus O’Connor’s Pub was calling our names. This pub, open since 1832, has exceptional food. I tried the St. Tolas’s Goat Cheese Tartlet—oh my! Dan had the more traditional fish and chips—crispy goodness to say the least. We understand that the key to making perfect fried fish is using soda water (club soda) when making the batter . . . or just go back to Gus’s! Once the music started, no one could have been pried from the pub. The uniquely Irish combination of an accordion, a black flute or two, guitars, fiddles and some interesting percussion instruments were incredible, but when a local patriarch wandered in and began singing . . . magic! He claimed to know the words to over 600 traditional Irish songs, which was completely believable given his performance. After a thoroughly enjoyable stay in Doolin, we headed cross-country to Dublin, both to visit my long time friend Patty and to catch a flight back to the US. To bring a little Southern US culture to Patty’s house, I decided to make shrimp and grits, my specialty. Off to the market: prawns = shrimp, polenta = grits, smoked streaky rashers = as close as we could find to Benton’s bacon, and Irish cheddar = wonderful! 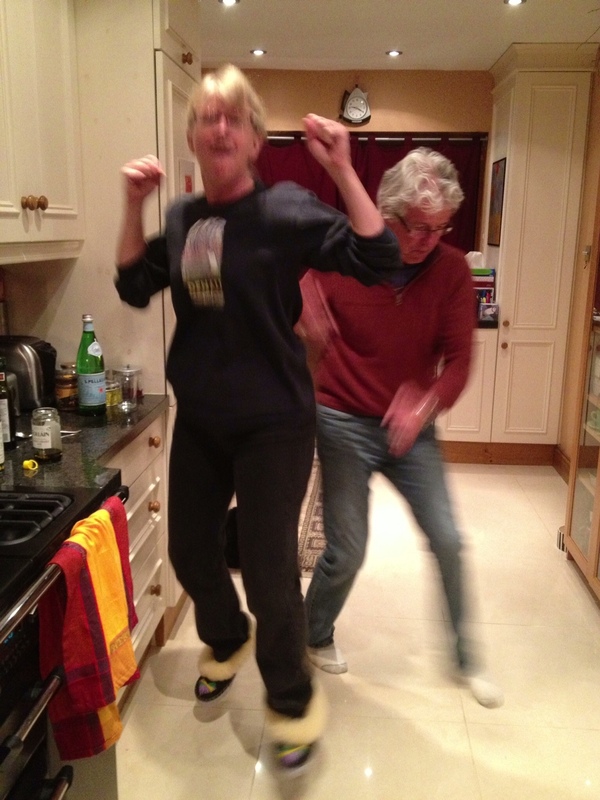 Spending a evening laughing with my husband and a lifetime friend, cooking prawns and polenta in Ireland, dancing and singing to Bruce Springsteen’s Live in Dublin CD—it’s the craic*! I just loved this whole article (Parts 1- and 2) The photos, videos…you describe it so well I feel I was there with you…but the Irish music is the best part! Thanks! Ireland is definitely on our list to visit again. We loved it. Such a beautiful, information-filled article, Lisa, and what amazing pictures! It was so much fun to work with, and instantly made me want to travel to Ireland at the very moment of first reading about Inis Oirr! Inis Oirr was so fun to wander by bicycle. I would love to hear what the guides with horses and wagons say, but the freedom of the bicycle was hard to beat. Wow. 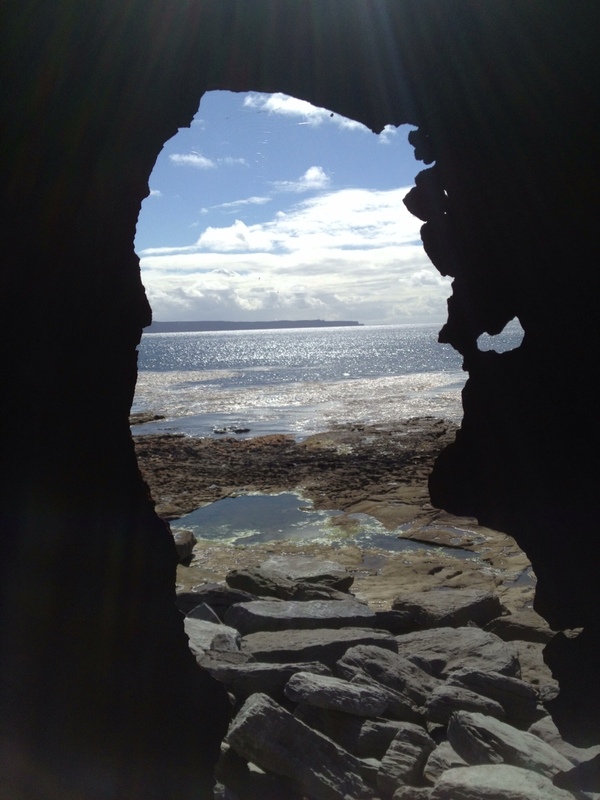 Inis Oirr looks amazing! Thanks! It makes me want to stack stone…for miles. 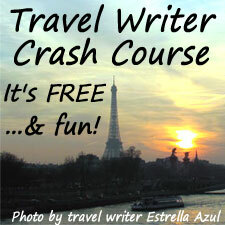 What a terrific trip – it looks like great fun and you know how to ROCK Ireland! The funny part is that we have seen so little of Ireland as a whole, but we wanted to be sure to fully enjoy what we did see. We have started traveling more and staying in one place for most of the time we go somewhere so we enjoy our time in the place even more. Lisa, I never saw this until now! I love it. My kitchen has never been the same, and I wish I could have you and Dan rockin’ the place regularly.